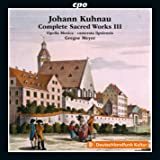 Johann Kuhnau, Bach's immediate predecessor as Thomaskantor in Leipzig, is believed to have composed at least as many sacred works as his great successor, but only a handful of these works have survived. 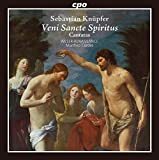 This CD is the first volume in an enterprising project to record all of the composer's thirty or so surviving sacred cantatas - which, judging by the present issue, may amount to about half a dozen discs by the time they've finished. Five of the works in the present issue are sacred concertos with independent instrumental parts, with one other work, 'Tristis est anima mea', being a 'stile antico' motet. 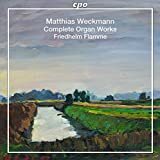 Every one of the cantatas is an interesting and attractive work, several of them richly scored for five solo voices, and their instrumental parts including brass, woodwind, strings and continuo. There are a few choral movements, here taken by the team of soloists singing with one voice to a part. Especially interesting for enthusiasts of music history, and of the development of German baroque sacred music which culminated in the works of JSB, is the adventurous way in which Kuhnau enhanced the role of the orchestra and integrated vocal with instrumental parts. In this respect we can clearly recognise a foretaste of his successor, and some of the groundwork for BWV 1-200 is very much in evidence. But Kuhnau's works are not only interesting as models for the future, but impressive and enjoyable on their own terms. So, for example, 'Es steh Gott auf' is a short but richly scored festive Easter cantata; 'Mein Alter kömmt, ich kann nicht sterben' is a graceful and eloquent solo tenor cantata with a distinctive spiritual quality, the solo part beautifully sung here by tenor Tobias Hunger. 'Daran erkennen wir' is a vigorous, spirited, richly scored work with lovely soprano duetting (track 18) and a very fine aria for bass accompanied by a pair of trumpets (19). 'Welt adieu, ich bin dein müde' is a substantial chorale cantata, with contrasting scoring from one chorale verse to the next and with plenty to do for each of the various soloists and obbligato instruments; verse 3, for two sopranos and two horns, is especially fine (24), and the return of earlier instrumental motifs in the later movements gives the work a powerful sense of unity and completeness. What is more, it's all performed and directed here with considerable flair and imagination. Unless I'm mistaken, the shorter motet 'Tristis est anima mea' is the only work here that has been recorded before - but, according to the excellent booklet notes as well as other sources, it may well not be by Kuhnau. The final work in the programme, the Easter cantata 'Wenn ihr fröhlich seid', brings a return to the Kuhnau pattern, with some good tunes, rich scoring and plenty of demanding work for the vocal soloists and instruments. The collection is greatly enhanced by the stylish performances from the vocal ensemble Opella Musica, all five of them with excellent voices including two appropriately boyish-sounding sopranos. The broad-based and diverse instrumental group camerata lipsiensis (spelt thus with no capital letters) are just as fine, with some especially distinguished work from the wind soloists - but in fact they all do a terrific job and are a great credit to their director Gregor Meyer, who conducts the proceedings with outstanding spirit and judgement. 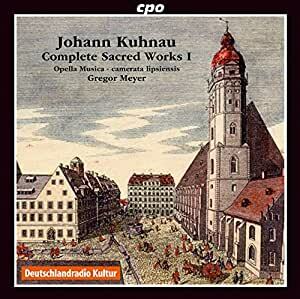 Excellent notes, detailed documentation as well as all texts and translations are provided, as is usual with the CPO label; in fact they have already brought us two other very fine discs of works by Kuhnau, although not part of the present series, Kuhnau: Seven Harpsichord Sonatas and Soprano Arias & Cantatas. 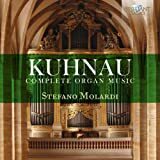 For the present programme, seen in the context of a German baroque hit parade with formidable competition from the likes of Schütz, Weckmann, Buxtehude and JSB, the music of Johann Kuhnau may not quite belong in the very top drawer. But all the works here are not only interesting historically, but graceful, expressive, varied and enjoyable - especially in such committed and musical performances as we are given here. So this is a fascinating and extremely worthwhile project, and I greatly look forward to subsequent volumes in the series.